Public television station KQED in San Francisco produced this documentary on the emerging commercial space industry. To put that into perspective, NASA’s Johnson Space Center employs about 3,000 civil servants and 10,000 contractors. (Or perhaps 12,000 contractors– the Houston Chronicle and various NASA websites give conflicting figures.) But that number is down from 17,500 workers in 2007 and will remain relatively flat, based on projected NASA budgets. 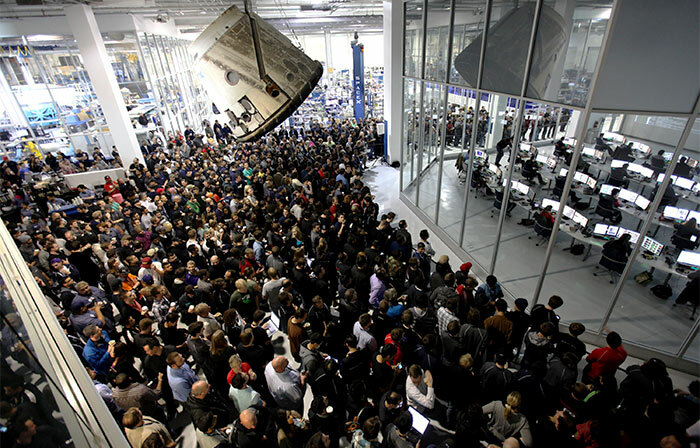 The SpaceX workforce, on the other hand, has the potential to grow rapidly as the company expands into commercial markets. Astrophobia is the fear of outer space. It can take many forms, from a fear of the stars to a fear of space travel. One example of the later is actress Jessica Chastain, who starred in the movie Interstellar. When Hollywood Reporter asked Interstellar cast members if they would personally like to go into space, Chastain was the only one who said no — quite emphatically. Yet, NASA chose Chastain to narrate this new advertisement for its Orion program. Based on official plans, Orion will carry only four astronauts into space, once every two years — the lowest flight rate since Project Mercury. It would appear that NASA, like Chastain, has a fear of flying in space [very often].